I don’t write a lot about the art projects I work on beyond photography, or the trips I take that end up having more to do with that work than my photography. I take my camera with me almost everywhere, but sometimes the lighting, weather or timing just doesn’t work out. This past weekend I was visiting a friend in Pennsylvania. We visited several different thrift stores and flea markets and I managed to score quite a few interesting items for future projects. My “finds” ranged from bits and bobs from a junk shop containing row after row of tables and shelves piled high with disorganized collections of broken dolls, old tea cups and holiday decor to a collection of antique books from a flea market. The books were my true find. It was a book about the Louvre which first caught my eye. Published in 1951, its boards were printed with fleur-de-lis and worn down just enough to give it age and character. I picked it up, planning how I might turn the boards into a purse and the interior pages into canvases, ornaments and cards. One of the two elderly women behind the counter approached me and offered the book to me for free, then directed me to the boxes of books at the other end of her table. I spent the next twenty or thirty minutes picking through books, purchasing the ones I thought I might make use of, turning down the ones that might actually be worth something to a book collector and gratefully accepting the more tattered books she offered me for free. When I left, I had two bags full of glorious old books. 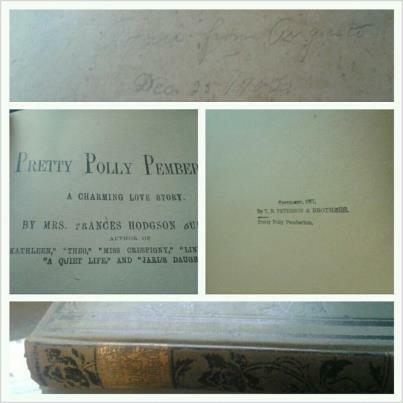 “Pretty Polly Pemberly, A Charming Love Story” was published in 1877 and bears the inscription “To Addie, From Angus W. Dec. 20, 1902”. 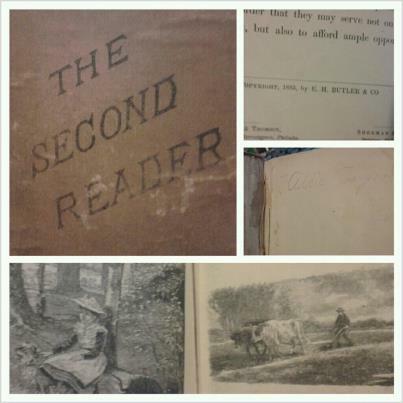 A discovered a bit more of Addie in another book amongst my finds. Her name was written on the inside cover of a school book dated some 19 years before she was given Pretty Polly Pemberly. I think these two books will remain amongst my collection, to be read and enjoyed and grant a bit of remembrance to Miss Addie. But, for the rest…the aged and tattered remains of poetry, children’s books and literature from the turn of the century, french fables and dictionary from the 30’s and the pieces of a 1875 German cookbook with the elaborate gilded cover of a religious tomb…these will be re-purposed, made into something else at what would have been the end of their usefulness. I’m perhaps overly sentimental, but creating recycled art soothes something in me that hates to see old things thrown away.